Red Bull Flugtag delivered exactly what was promised: a lot of hype and and faux gliders careening into the Delaware. Are those trashed "gliders" recyclable? Red Bull estimated 85,000 spectators. 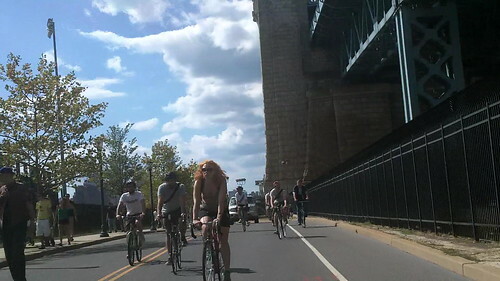 The Camden Waterfront is used to handling event traffic, but despite the 2 mile almost traffic free trip from Old City, bikes are usually a rare sight at these events. Even public transportation (sans ferry) is somewhat underutilized. But word got out through the Internet that PATCO trains were as packed as the Tokyo Subway and that the Ben Franklin Bridge offered the best unobstructed views. Many didn't even know that you could even get up on the bridge. And DRPA was ready for the crowd. For the first time in at least 10 years the North and South Walkways were both opened (Cyclists were required to walk on the South but were allowed to ride on the North). Bridge Chief Operating Officer Valerie Bradford was on hand with DRPA police to help manage the crowd. Back at the waterfront a couple of hundred bicyclists adapted to the lack of bike parking by stacking bikes two high on parking area fences. If nothing else the response of cyclists and pedestrians demonstrated the utility of good non-motorized connections between the two cities. Too bad cyclists were actually banned from the event itself. Red Bull is a joke.